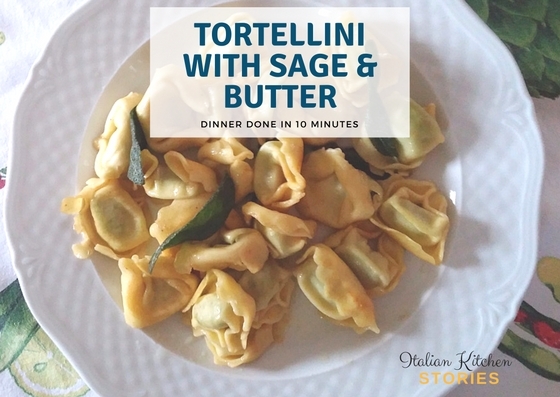 Usually I make tortellini with sage when I need quick dinner or when I’m out of the ideas what to cook. Procedure to prepare the tortellini with sage and butter is super simple. 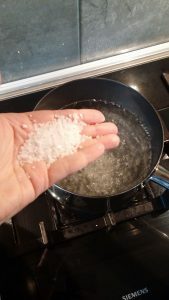 Step one – Bring water to boil and add salt. On that amount of water I grab about full spoon of the coarse salt and I add it when I see the first bubbles popping out. 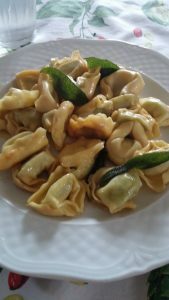 Since tortellini cook really fast, you need to put them in water and quickly move to preparing the sauce. I usually male sure that I stir them as they tend to stick in one position. 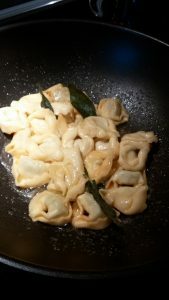 Tortellini are ready in 3-5 minutes (depending on the manufacturer) and you will know they are ready when they all start floating on top of the water. 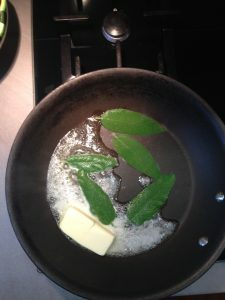 Add to your frying pan bunch of fresh sage leaves and a nice chunk of butter. Once the butter is melted sprinkle with salt. Make sure that your heat is not too strong or your butter will start to burn. I make it over medium heat while the butter is solid and once it’s melted I lower it. Sage leaves will change the color in light brown and will leave all its aroma in your butter. Scoop the tortellini from the water and putt them in your sage and butter sauce. Stir 2 – 3 times so that butter would hug 🙂 your tortellini from all sides and turn off the heat. Serve immediately. You can eat them as they are or sprinkle them with grated Parmesan cheese. 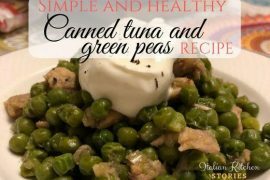 Let me know if you have tried this recipe and how did it come out. Was it easy to prepare.